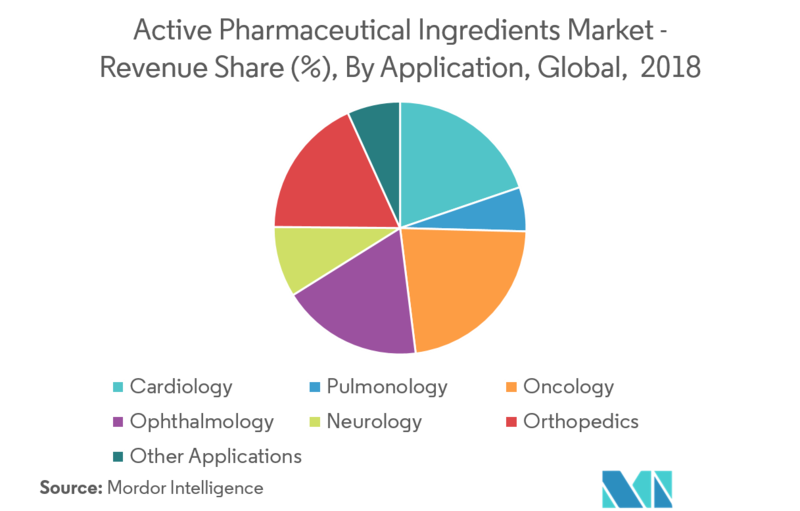 The global active pharmaceutical ingredients market was valued at USD 165.74 billion in 2018, and is estimated to reach USD 236.7 billion in 2024, witnessing a CAGR of 6.1%. Some of the key factors that are driving the market include the increasing prevalence of infectious diseases, cardiovascular conditions, and other chronic disorders. Apart from these diseases, genetic disorders are significantly driving the usage of of biologicals and biosimilars, globally. Biosimilars, in many instances, serve as low-cost options. They hold the potential to create a more sustainable healthcare system by making room for innovation, so that more patients continue to receive the best possible care. 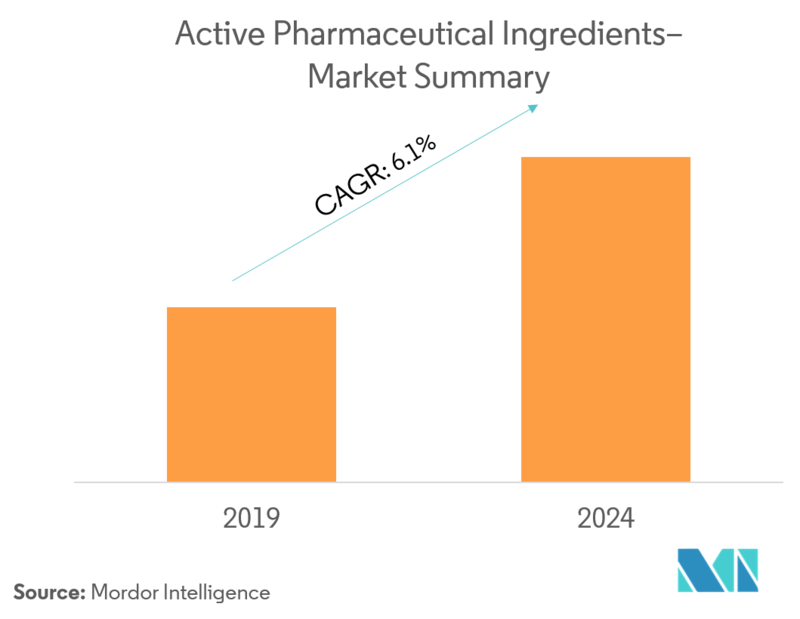 The active pharmaceutical ingredients (API) market has traditionally been dominated by drugs, such as anti-infectives and the diabetes, cardiovascular, analgesics, and pain management drugs. However, as per the R&D trends, the demand is shifting toward the development of complex APIs used in novel formulations, targetting niche therapeutic areas. A large number of drugs are in the pipeline to develop treatments for cancer, autoimmune disorder, and metabolic diseases. Owing to the rising prevalence of cancer, several manufacturers are venturing into the development of highly potent APIs (HPAPI) and specialty APIs, in order to cater to the rising demand for these products. Active pharmaceutical ingredient (API) is a part of any drug that produces its effects. Some drugs, such as combination therapies, have multiple active ingredients to treat different symptoms or act in different ways. They are produced using highly technological industrial processes, both during the R&D and the commercial production phase. The API market, by application, is dominated by the cardiology segment, due to the vast population using various CVD drugs. This segment is projected to witness a CAGR of 6.05% during the forecast period. Coronary heart disease (CHD) is the most common type of cardiac disease, with a death toll of over 370,000 people, annually, in the United States alone. According to the American Heart Association (AHA), cardiovascular disease accounts for 17.3 million deaths per year. The Centre for Disease Control and Prevention states that about 610,000 people die of heart diseases in the United States every year, i.e., one in every four deaths can be attributed to cardiovascular diseases (CVDs). Cholesterol reducers and blood pressure lowering drugs are the key drug classes under CVS. Cholesterol reducers, especially Statins, are driving the CVS segment, and have emerged as the most important family of drugs among the cholesterol and triglycerides reducers. Healthcare spending for hypertension was USD 23 to 26 billion in 2017, in the developed markets alone. Another USD 14 to 17 billion was spent in 2017 in the pharmerging markets. The high expenditure on the cardiovascular category highlights the rising demand for APIs in the same. North America currently dominates the market for active pharmaceutical ingredients, and is expected to continue its stronghold for a few more years. This region is expected to increase its market share in the future, owing to the increasing incidences of disease and rising aging population. The United States holds the majority of the market in the North American region. However, the majority of its API requirements are met through imports from the Asian Markets. The trade statistics suggest that nearly 75% to 80% of the APIs imported to the United States are from China and India, as these countries have well-established manufacturing facilities and an abundant talent pool serving the pharmaceutical sector. The recent political and trade policies implemented by the US government to increase import duties and taxes are expected to drive operational costs and increase the pricing pressure on the manufacturers. The FDA has also increased the application fees for new drug approvals and has increased the number of periodic inspections conducted on various off-share contract manufacturing facilities to ensure the supply of high quality products to the US market. 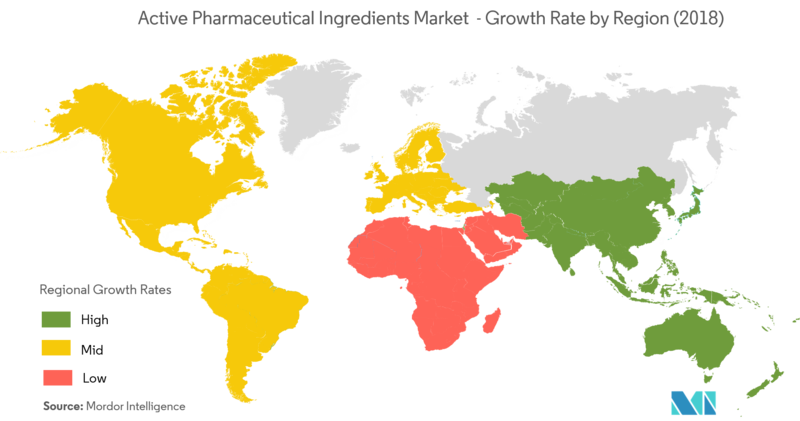 The active pharmaceutical ingredients market is highly competitive, and consists of several major players; thus, indicating a fragmented market scenario. The API market has several manufacturers from China and India holding a dominant market position, due to their large manufacturing footprints. In Europe, Italy, Germany, and the United Kingdom are the key regions for API trade, due to the presence of a well-developed pharmaceutical and lifesciences industry. A majority of the APIs produced by reputed MNCs are used for captive production. 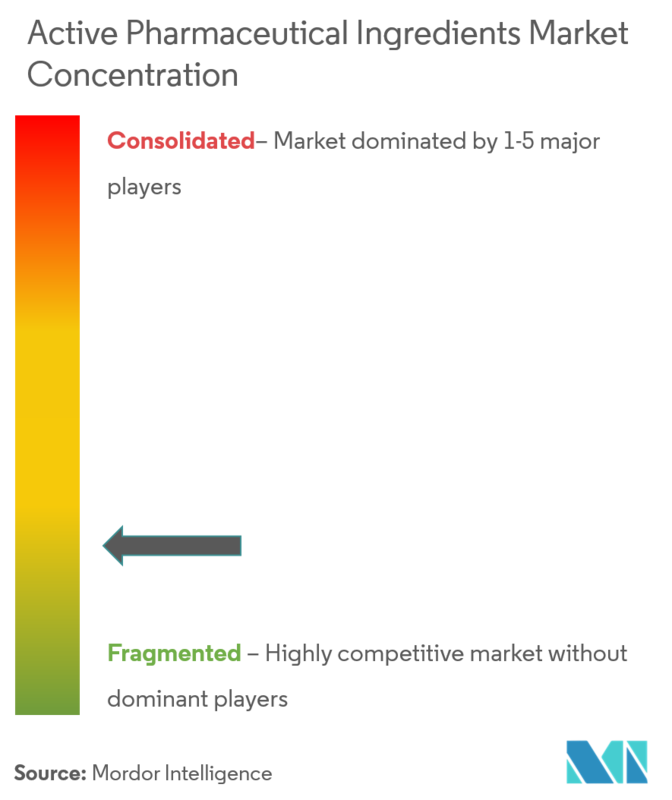 However, few players have emerged as contract manufacturers with a diversified client base. Further, with increasing technological advancements and product innovation, mid-size and small-scale companies are increasing their market presence, by introducing new ingredients with competitive prices. Companies, like Teva, Pfizer, Aurobindo, Sun Pharmaceuticals, Novartis, Mylan, and Boehringer Ingelheim, hold substantial market shares in the active pharmaceutical ingredients market.